I simply LOVE hiking. These’s something about venturing off into the woods for the day and just spending time with nature that resonates with me. Weather its hiking a mountain, trekking to a lake or snowshoeing (I consider this winter hiking!) through the forest, its one activity that truly makes me feel alive. And the views no matter where I am are always worth it. But lately I haven’t been able to get out and pursue this love in areas close to home due to injuries and honestly, a lack of new places to explore. 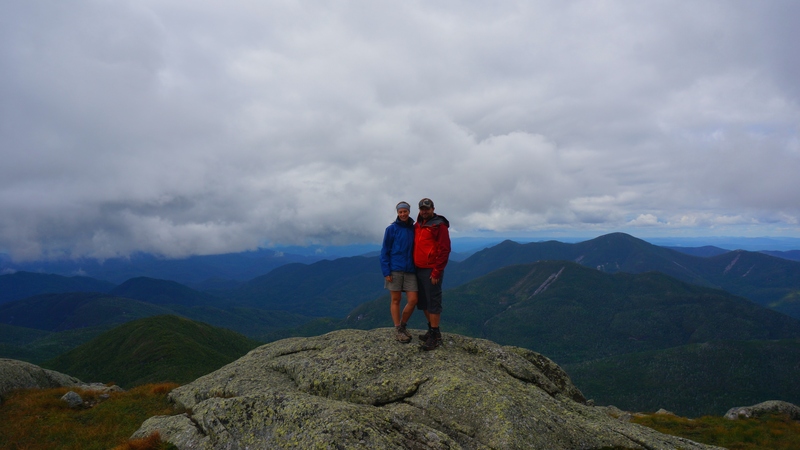 So this summer when some friends of mine invited by boyfriend K and I to go hiking in the Adirondacks (Lake Placid, New York) for the weekend, I didn’t hesitate to say a resounding “Yes!”. 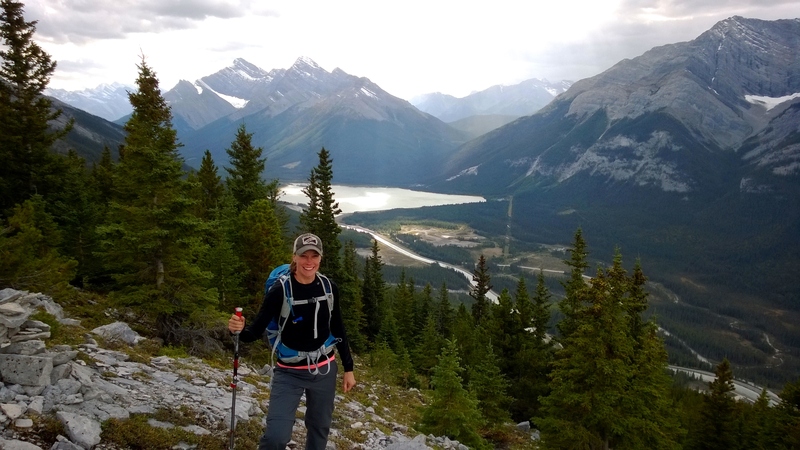 Hiking in the Rockies just outside of Canmore, Alberta. I’d never been to the Adirondacks or Lake Placid before but had heard wonderful things about the area. Only 3 hrs drive away from Ottawa, I felt like a new door of exploration had been opened for me. I knew there were some great hikes to do out there so in preparation for this trip, we all started to research the area, searching for a perfect one day hike for the 4 of us to tackle on our weekend getaway. As I goggled the Lake Placid area for inspiration, I learned that the Adirondacks are the oldest mountain chain in North America, though they don’t necessarily resemble a “chain” like the rocky mountains out west. This group of mountains is more of an eroded dome shape, containing many peaks either on their own or in clusters. Of these over 100 peaks, 46 belong to the High Peaks Club, meaning they rise to an elevation of 4,000 feet or more. 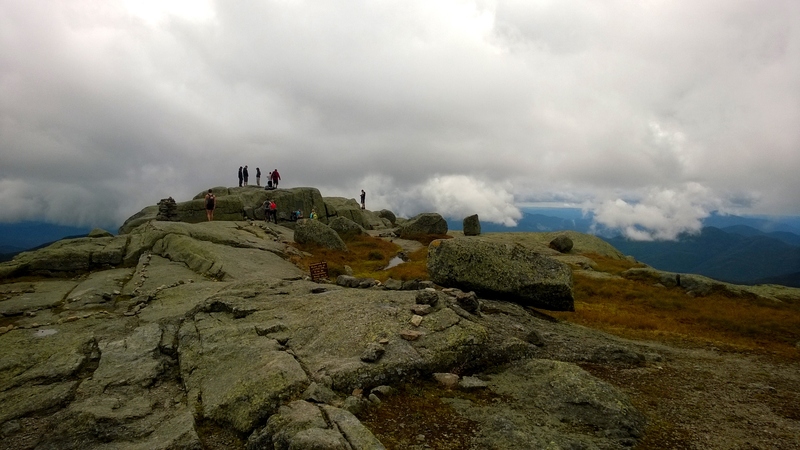 The highest peak, Mt Marcy, reaches a total elevation of 5,344 feet, one of only 2 peaks that breaks the 5,000 feet marker. 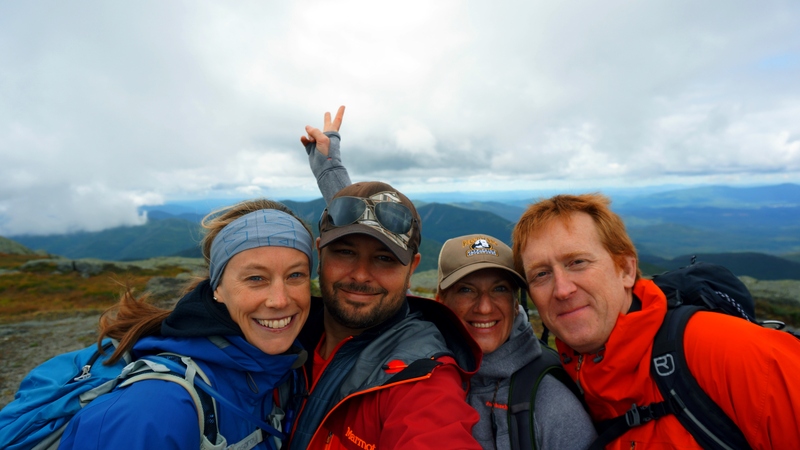 With this being my first trip to the Adirondacks, I wanted to hike the highest one, Mt Marcy. Our friends agreed, with my boyfriend K being the only one to have reservations about hiking 24 miles in one day (can’t be that hard, right?). Our expedition began one Friday afternoon in August as we made the drive south east into the USA. We arrived at our accommodations late in the afternoon and meet up with our friends. Having had no part in choosing or booking our rooms for the night I was elated to see the cute little “rustic” cabins we’d be staying in for the weekend. The Van Hoevenburg cabins were located right beside the Olympic bobsled park, about 10 min drive from the town of Lake Placid. Out in the country side, they were the perfect choice for our weekend in the woods, complete with a bonfire pit and BBQ. After settling in we headed to town for dinner and to sample the local beer. We knew we’d found the right place when we arrived at the Lake Placid Pub & Brewery, as the establishment was packed with locals and tourists alike. The beer was great and the food even better (try the pizza!) and we felt we’d had a good introduction to the area as we headed back to our cabins. Waking early, we made our own breakfast in our little cabins and then headed off to the Adirondack Loj, the trail head for some of the 46 peaks just 10 minutes drive from our cabins. We were warned to arrive before 8:00 am as the parking lot filled quickly, especially on the weekend. We got there in good time, checked in at the Loj and headed out on the trails. The trail began easily enough, as we hiked on a beaten down path through the woods. After about half an hour we came to a beautiful lake and stopped to snap a few photos. Taking a bridge to cross the stream that flowed out of the lake, we continued onward and upwards. It was here that the trail began to get a bit more difficult. Filled with rocks and boulders, we followed the trail beside the stream, eventually crossing the stream once more. Things picked up yet again, with the “trail” turning into a small muddy stream of its own. We had to weave our way up, over and around all the obstacles the forest had set in front of us while climbing up the steep pitch of the mountain. The stream flowing down the mountain. As we continued, we encountered stream crossings, muddy swampy areas with a boardwalk of loose logs acting as our bridge, and did I mention lots of rocks and boulders? Despite all these hurdles, I was in love with hiking again! It felt amazing to be working every muscle in my body as I breathed in the clean mountain air and found a steady rhythm. K and I were on fire, eating up the trail and soaking in the energy from the forest. We took breaks as needed to have a drink and a snack and simply enjoy being in the woods. The “trail” that looks more like a river bed. Logs acting as a bridge. As we approached the top, the trees began to thin and we started to catch glimpses of the Adirondacks as they stretched out peak after peak. Eventually we arrived at a clearing that offered the best view so far, and the worst view. We could finally see the world around us and enjoyed looking out at the horizon. It felt like we’d made it to the top of the world! But then we looked up… and up… and finally saw the peak of Mt Marcy covered in a low hanging cloud. We were still a fair distance from the summit and by the looks of it, the toughest part was yet to come. We can see the top! Determined to make the peak and hike the highest point in New York state, we set off with a new found resolve. Half hiking and half rock climbing we scrambled our way to the summit. And it was totally worth it. Catching our breath we wandered around the flat bare rock summit, soaking in the incredible views of the Adirondack mountain range. After taking numerous photos (gotta have some photographic evidence of this!) and pulling out an extra layer of clothing for the cool chill in the air, we found a spot to settle in and dig into our lunch. After hiking for 6 hours, I was starving! While we ate, the cloud cover began to thin out and by the time we were up and ready to begin our decent we had clear views in all directions. Me, K and our friends M & M at the peak. I’m not sure which part was more difficult: going up or climbing back down! Dodging boulders, mud puddles and fallen trees we bounded our way back down the trail. With another hour or two to go, we came to stream crossing that had a sign pointing to a place called Indian Falls. Deciding we needed a break and wanting to explore, we ventured off our trail and onto this short path that lead us to an incredible lookout at the top of a waterfall. The water flowing by us was crystal clear and very cold. I couldn’t resist the temptation and took my hikers and socks off to let my poor hot, swollen feet have a moment of relief in the soothing water. After a very long day of hiking we finally made it back to our car and fell into our seats. I joked that when we arrived back at our cabins, none of us would be able to stand and we’d simply fall out of the car. After a much needed shower we headed over to the BBQ and bonfire area to cook our dinner and enjoy the camp fire. 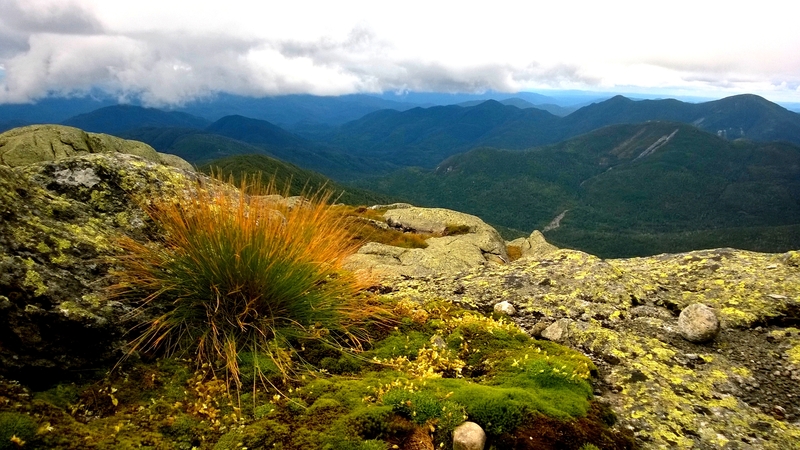 As we left Lake Placid for home the next day, I filled with a renewed love for hiking. I guess I’m a bit of an adrenaline junkie and love the “runners high” you get after a run/hike/bike. It makes me feel so alive and healthy and full of energy! I was so happy that our friends had invited us on this trip and introduced me to this ancient mountain range so close to home. K and I decided that we’d be back and have made it a life goal to hike all of the 46 High Peaks in the Adirondacks. This may take a few years (decades) to accomplish but it will keep us coming back to explore this incredible wilderness area. 1 down 45 more to go! Another great article, Jill! Really enjoyed reading about the Adirondacks and the pictures are wonderful! Great post! 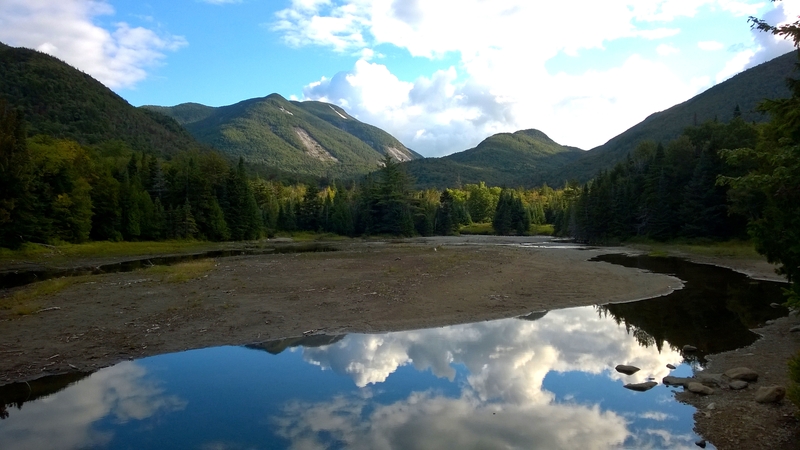 I love the Adirondacks … it’s enormous and beautiful. Fantastic vantage points that many would never get to see if it were not for your sharing of these images! Thanks, I’m glad you liked it! Its such a beautiful area and I’ve only just discovered it. Lots more exploring to do in the Adirondacks! I love this! It really does look entirely different than it does in the winter time! I think I am going to have to give it a climb one summer, just to see the difference for my own eyes. It’s absolutely beautiful either season, and hard to believe that they are the same location. You should give it a try in the summer! I’m planning on going back to the Adirondacks this winter to hike another high peak and to see what it looks like in the winter. I’m intrigued after seeing your photos of Mt Marcy covered in snow. And weren’t those cabins cute?! I just fell in love with the Adirondacks and Lake Placid so I understand your obsession!